The Jet Conversion Engine simplifies even the most complex Xero conversions using advanced formulas and processes to make it super-simple to get business-growing performance from your Xero data. Want To Know How To Configure Your Data For A Quick & Accurate Conversion? In this free conversion checklist you will discover important accounting data tips you need to know when converting to Xero. Want a comprehensive, fully-detailed conversion so you get the very best from Xero? 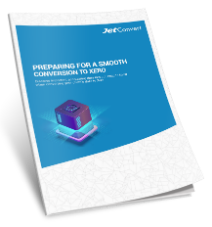 Consider the Jet Convert Accelerate conversion option which provides the maximum service available. Who We Help: Is This You? While many accountants, bookkeepers and companies are keen to make the switch to Xero, some are wondering where to start and how to make the process quick, easy and hassle-free. Worried About Ongoing Business Operations? Concerned About The Complexity If It All? Don't Want The Headache Of Doing It Yourself? And like most accountants, bookkeepers and business owners, maybe you’re looking for an easier way to transfer to Xero with accuracy and security, in a matter of days. The good news? We’ve helped over 40,000 businesses overcome these problems using our easy-to-use, state-of-the-art conversion platform. Can we help you, too? The team at Jet Convert has helped more than 40,000 accountants, bookkeepers and their clients successfully convert to Xero over the past 5 years. Every month we convert up to 1.2 million+ transactions, 10,000+ employees and 750,000+ contacts. We’ll provide some pre-conversion recommendations prior to uploading your file, so you get the best performance from Xero. Simply upload your file via our website. Quick tip: Do not a Xero org… we’ll take care of that for you. You have the option to choose from three of our conversion packages, depending on how you wish to use your data in Xero. We perform an automated conversion to Xero using our sophisticated transfer processes (no manual or double handling data). Please note our package options below. fixes that we have identified (so you can fix things easily and quickly). Your conversion is complete! You’re able to log into your Xero account and see your data. customer, supplier and stock information. ” It was awesome! Converted the same client’s file to Xero and Reckon at the same time. Client looked at both and went with Xero. conversion with Jet Convert numerous times as a great way to move our clients to Xero. Our only complaint was that often the MYOB chart was not properly set up. With the Advanced Practice offering by Jet Convert that problem is now eliminated, making moving clients to Xero a completely stress free undertaking. Completely endorsed by Xero, the Jet Conversion Engine simplifies even the most complex Xero conversions using advanced formulas and processes to make it super-simple to get business-growing performance from your Xero data. Through our partnership with Xero, your Basic Conversion is Free, and Premium Conversions are heavily subsidised. Ready to Convert to Xero Accurately, Securely and Easily in as Little as Just 3-5 Business Days? When Jet Convert can help you convert to Xero quickly, easily, accurately and securely, most Xero Advisors feel it’s just not worth the time, effort and risks of trying to do it yourself, especially when you need to? Jet Convert has helped more than 40,000 accountants, bookkeeper and their clients convert to Xero quickly, easily, accurately and securely. Let us help you too.